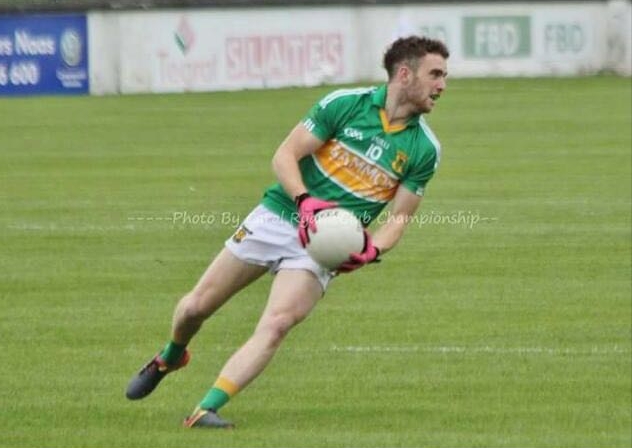 Conor Caulfield has been confirmed as the new Captain of the Kilcock Intermediate footballers for the upcoming 2018 season. The Monaghan native, who enjoyed a fine debut season at midfield for his new club in 2017, takes over from the recently retired goalkeeper Shane Stone. Caulfield’s powerful displays at midfield were instrumental in Declan Gibbons’ charges reaching the Intermediate final where they lost out to favourites Raheens. He also showed his leadership qualities in the final round of the league by scoring a crucial last minute goal to help Kilcock survive in division two. Gibbons will have taken all this into account in making his decision and has put his faith in the former Scotstown player to try and help his youthful side go one step further in 2018. 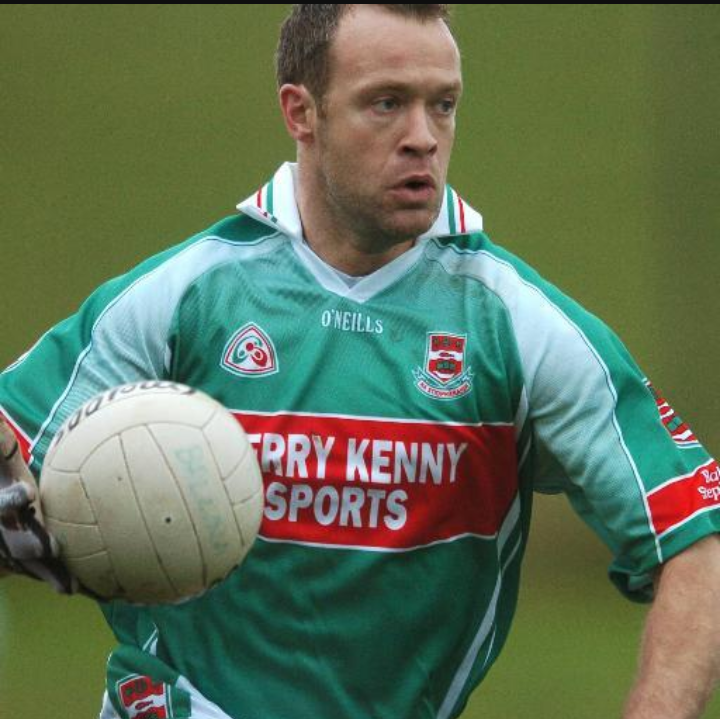 It is rumoured that Clane Gaa are set to appoint former Mayo footballer David Brady as the new manager of their senior footballers. If Brady does take over he will have a decent crop of youngsters to work with, as the club were only recently crowned minor football champions. In addition to that the u21 footballers have a championship semi final to look forward to this weekend against Sarsfields. 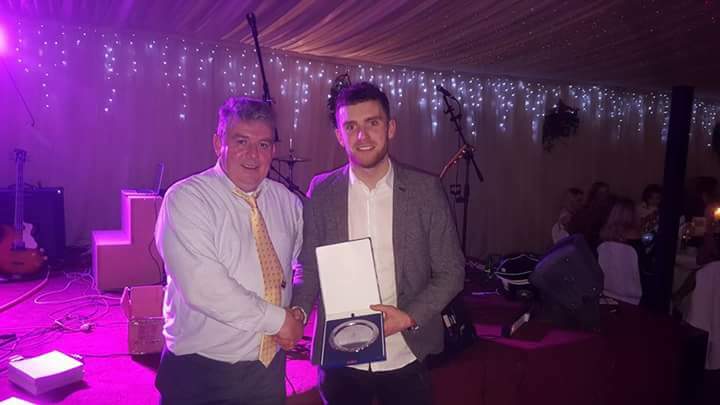 Kildare Intermediate football finalists Kilcock have had four players named on the ‘Kildare Nationalist Intermediate team of the year 2017′. Declan Gibbons’ team are represented by defender Jason Gibbons at wing back, Daniel Courtney at midfield, David Duke at wing forward and Ciaran Murray at full forward. 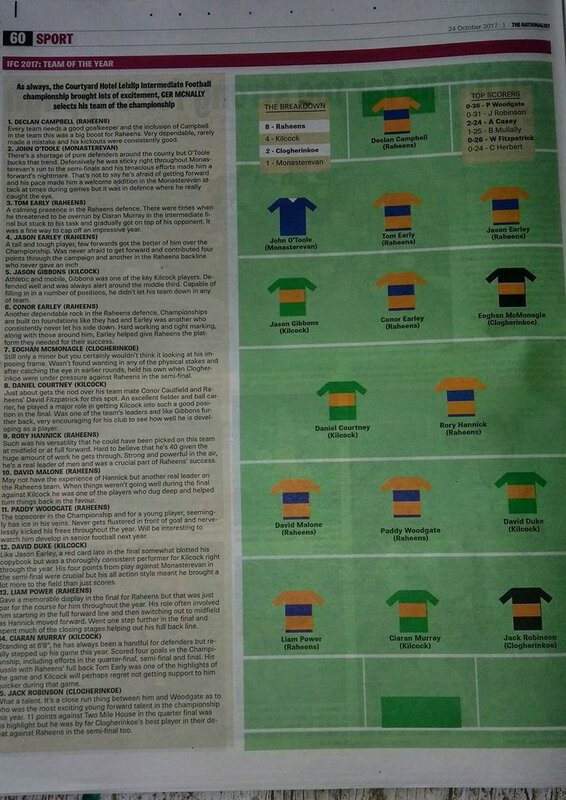 The team was compiled by the Sport’s Editor of The Kildare Nationalist Ger McNally and also includes eight players from champions Raheens, two from Clogherinkoe and one from Monasterevan. 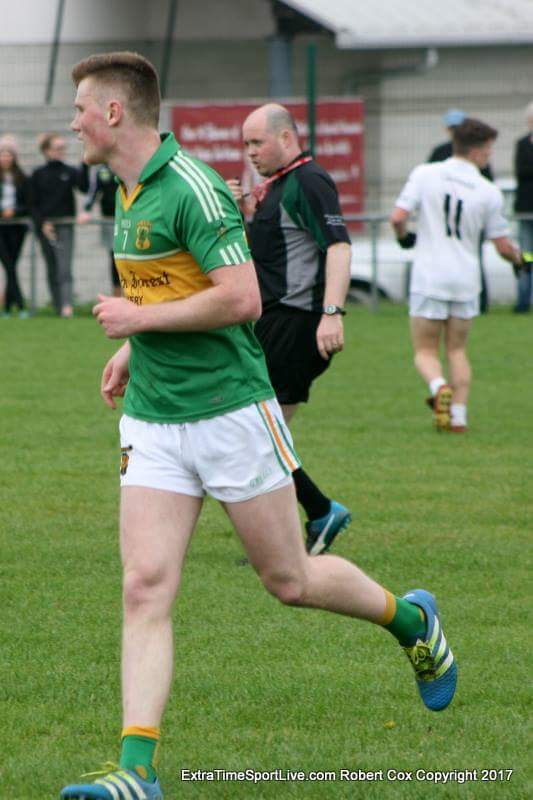 Gibbons enjoyed a fine full first season at adult level, having gained some experience in 2016 after helping the Kildare minors to Leinster championship glory in the summer. Courtney was pivotal in Kilcock’s run to the final from both half back and midfield, with his powerful runs through the middle a regular sight in every round. He has since been called up to train with Cian O’Neill’s Kildare. David Duke had an excellent season after converting to wing forward and chipped in with some fine points, especially against Raheens in round 2. Murray really came to prominence when the competition reached the knock out stages and was the vocal point for every Kilcock attack, netting his 4th goal of the championship in the final. Had the referee rewarded his hard work with some frees in the showpiece, Kilcock may well have taken the cup home!! 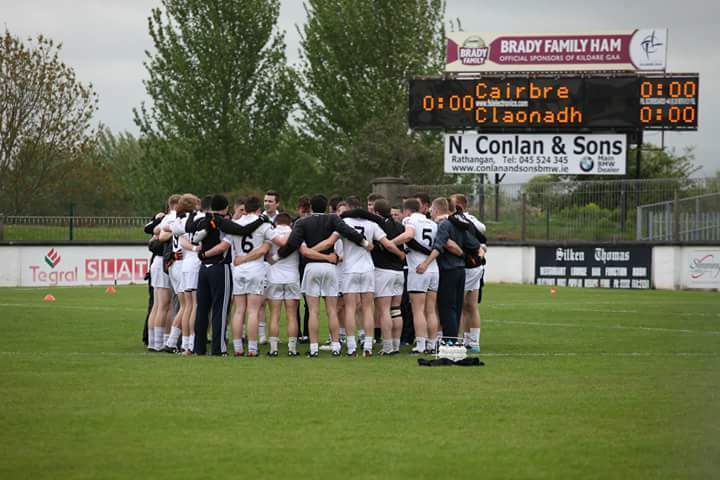 McNally’s side is a fair reflection on what was another very enjoyable Kildare IFC and if I was to make any additions from the men in green and gold I would have to go for Fearghal O’Brien and Conor Caulfield. Daniel Courtney in action for Kilcock v Clane during the 2017 league. Kilcock duo Daniel Courtney and Eoin Powderly have been invited to train with an extended Kildare Senior Football panel over the coming months in preperation for the 2018 season. Both men played a vital part in Kilcock reaching the Intermediate final, where they eventually fell to an impressive Raheens side. The pair have previous inter county experience with Courtney a member of the 2015 Leinster minor winning side, where he lined out in midfield. Corner back Powderly was part of O’Neill’s senior panel in 2015 before suffering a cruciate ligament injury but to his credit he made a remarkable recovery in returning to full fitness to aid Kilcock’s run to the recent county final. Only this week Emmet Bolton retired from inter-county action and O’Neill will be looking replace him and any future losses by blooding some more youth as his side look to close the gap on Dublin in the coming years. 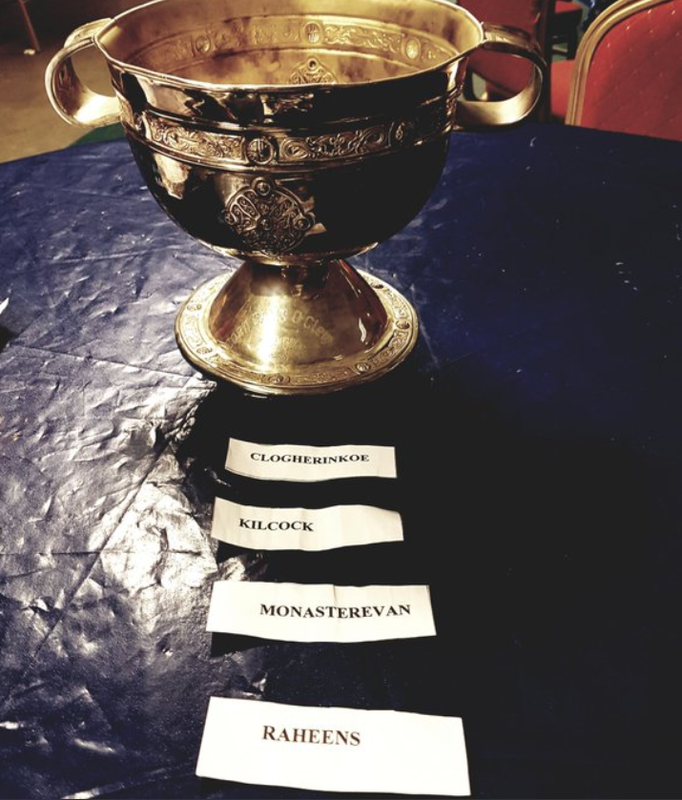 Kilcock have been drawn to play Monasterevan in the semi final of the Kildare Intermediate football championship. Declan Gibbons men reached the last four after a 1-11 to 1-8 victory over Ballyteague in Hawkfield on Sunday evening. A game that looked like it was going to be a routine win for the North Kildare men when they led 1-9 to 0-4 midway through the second half, turned into a nervous ending as Ballyteague rallied with a flutter of scores including a penalty. Willie Bright kicked a couple of late points to settle those nerves and put his team within one win of the county final. Standing in their way though is a dogged but decent Monasterevan team who defeated Suncroft 3-10 to 0-11 in the last of this weekends quarter finals. Kilcock avoided favourites Raheens, who were pitted against another useful side Clogherinkoe in the other semi final. It’s a difficult one to call now, with little to seperate all four sides but one thing is for sure whoever does turn senior in the next few weeks will have worked hard for it. I fancied Raheens from the start and after a diappointing loss to Kilcock in round 2, they bounced back with two impressive wins against Rathangan and St.Kevins. For that reason I am sticking with them to be playing in the senior championship in 2018.